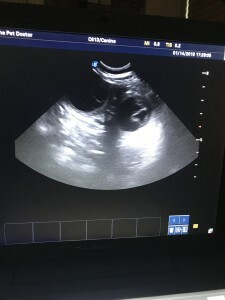 Our sweet Sauvie and Jupiter are expecting again! Just in time for your sweet Valentine! 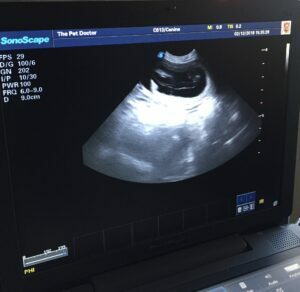 Sauvie had her ultra sound on January 14th confirming 7 puppies! 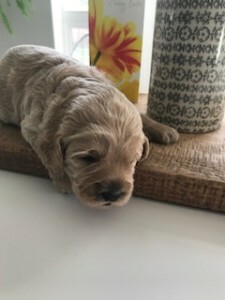 There are still four openings for this litter. We have enjoyed the sunshine here in the beautiful Pacific Northwest. Sunshine calls for rolling in the dirt and playing tag with the litter mates! Two hours later and all nine puppies were squeaky clean. 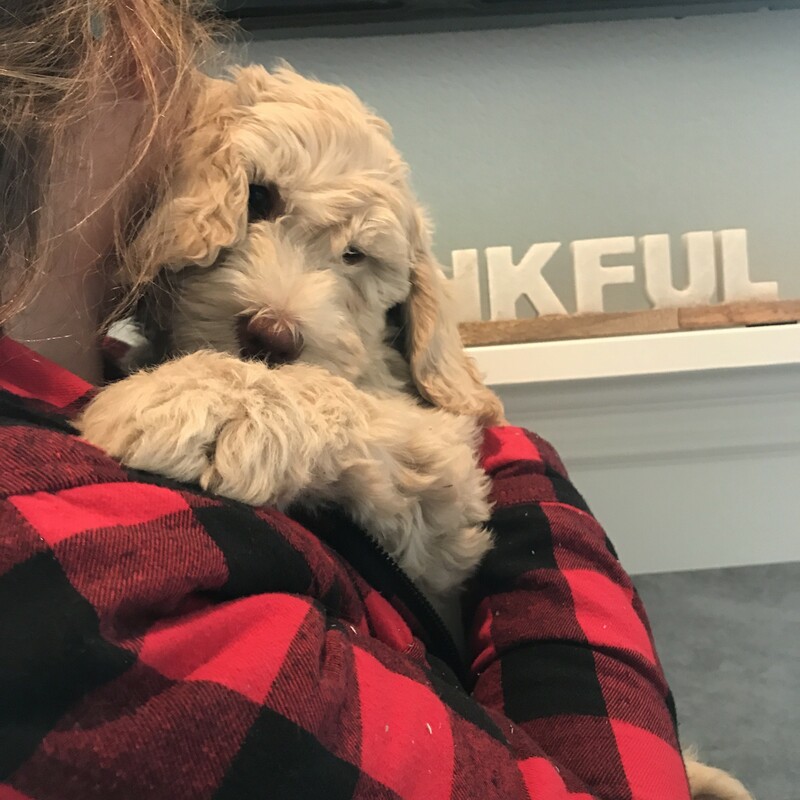 Our sweet doodles are ready for their night time cuddles. 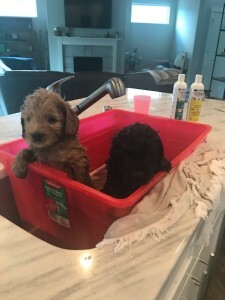 Here we have two of our sweet doodles getting a bath before bedtime. 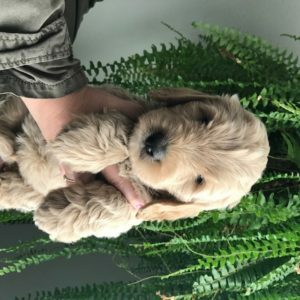 I wanted to take a minute to share with you all and brag on my sweet 4 week old doodles. Yes, this is a puppy litter pan you see in the puppies pen. And yes, if you look close enough you will see several poo piles. Sorry for the unpleasant topic. I think it is so important to begin training at this young age, even though they are still weeble wobbles with their little paws, they find their litter pan and make this their designated potty area. I begin introducing my puppies to the litter pan at 3 weeks of age. By the time they reach 4 weeks old, all of the puppies are putting their poo in the litter pan and beginning to learn to pee in it as well. This is my first step in my potty training. I use a puppy litter called ‘SoPhresh’ it is basically tiny rolled up newspaper pellets. 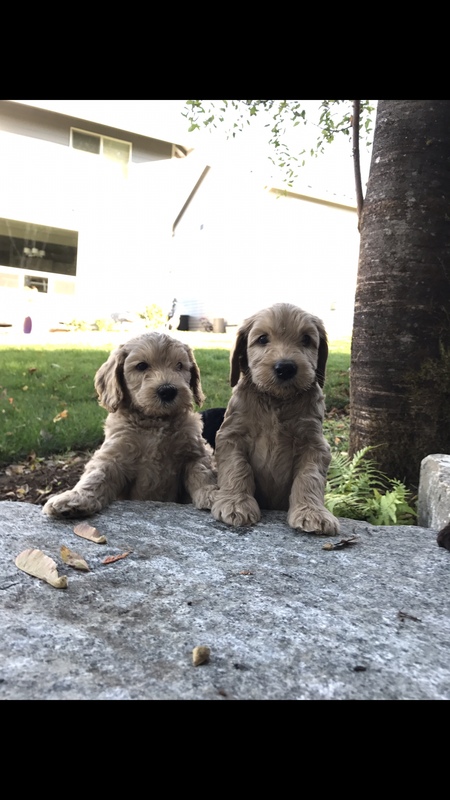 We have one boy and one girl available in this Sauvie and Jupiter litter. 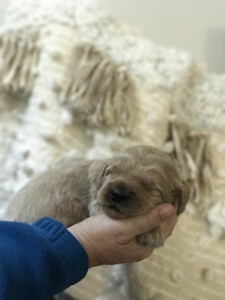 These puppies are very smart and have beautiful wavy fleece coats! Meet Flynn Rider. Our puppies turned 3 weeks old today! Oh my! 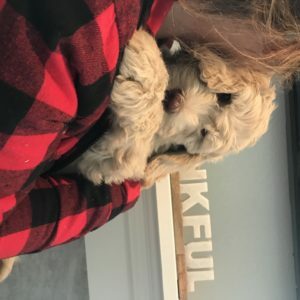 These puppies are absolutely adorable and as cuddly as they come! Little Teddy Bears! Their little grunts and puppy breath! Oh my! If you want to warm your heart and put a smile on your face come cuddle one of these sweet puppies. 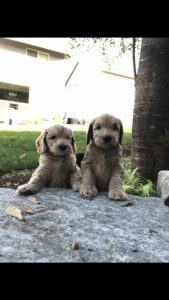 These Multigenerational Australian Labradoodles are non shedding allergy friendly and sweet as candy! We are smitten with everyone of them. We raise our puppies in our home. Every time we walk by their pen we can not resist picking them up for some puppy cuddles. I begin starting them on potty training at three weeks old. 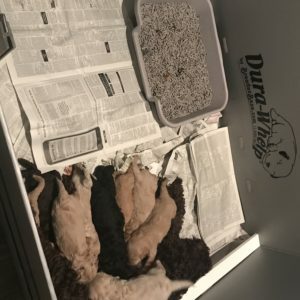 By the time they reach 5 weeks old all of the puppies will be using their puppy litter pan to potty, keeping their sleeping and play area clean. This breed is very smart and desire to please their ‘human’ family. It is us humans needing to learn how to train and communicate to our puppies. I like to use clicker training. We will have started some basic training with our puppies using the clicker. 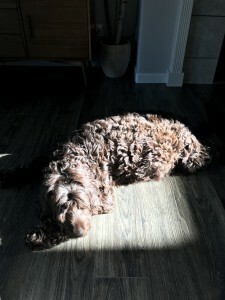 Our sweet Sauvie and her ‘puppy bumps’ are enjoy a glimpse of Sunshine! Our Sauvie IS a Ray of Sunshine! She BRIGHTEN’S everyone’s days! Sauvie is due to have her litter of puppies any day now! We are thrilled to see the rainbow of colors in this pairing. Sauvie is a true chocolate with a slight red highlight to her coat. Cooper the (stud) has a true deep red coat. Stay tuned for our litter announcement coming very soon! If you have been feeling the puppy Spring fever we have your fur ever pal! Ready to join you this Spring! Middle of May.